Lost in a stolen desert lies, the apple of their inner eyes, which Newton's levity defies. Still, ABC and XYZ, down bifurcating pathways led, and came to rest, once quick, now dead. All this for free? Yes. Read about the legal status. 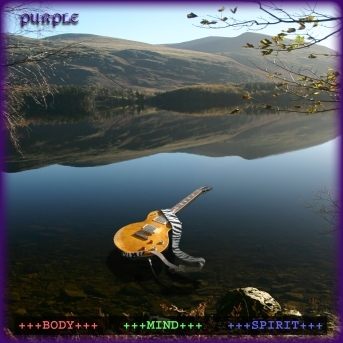 BODY:MIND:SPIRIT is the third album of the Purple musical project. Nearly two years in the creation, this is the most ambitious album yet, both in musical diversity and production values. The focus is on the number three, on trilogies, on triplicates and on triplets. There are three tracks, with nine sections each: three groups of three. Each section (well nearly all) is 3 minutes long, making a whopping 80 minutes of music in total. Solomon Linda - The Lion Sleeps Tonight.